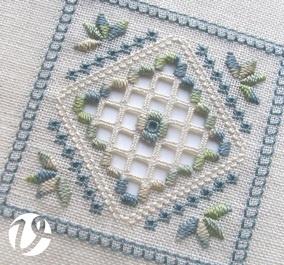 Vetty Creations has a range of embroidery patterns, specialising in Hardanger embroidery patterns. Our Mountmellick designs are supplied as kits only. Click on the title or picture for more information and a larger picture. Beginner level. 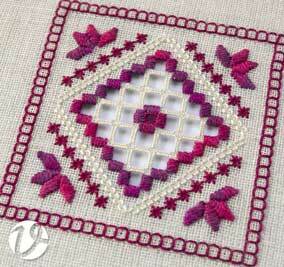 This pattern is designed specfically for beginners to learn hardanger embroidery. It has extensive step-by-step instructions with diagrams. Pattern and step-by-step instructions only. More information about Blue green Hardanger panel. More information about Raspberry Hardanger panel. More information about Anniken Hardanger runner. More information about Hardanger needlecase. More information about Sapphire Hardanger bookmark. More information about Organza hardanger ornament. More information about Hardanger Christmas ornament. More information about 2005 Blackwork Christmas decorations. More information about 2002 Blackwork Christmas decorations.